AIR Niugini Limted’s management says it does have a number of expatriate staff on its cabin crew. The airline says these workers are from the Philippines, Fiji and Solomon Islands and were to address language issues with its passengers travelling on their international routes. Further that these workers are paid on a similar salary the national cabin crew. Air Niugini was responding to questions that had been raised with it, in light of concerns that have surfaced and reportedly by some of the airline’s national staff-that they were being paid higher despite the fact that they were doing equal load. “The importance of language translation is critical for safety and compliance and customer services,” the airline’s management said. "The cabin crew is the face of the airline and Air Niugini as an airline recruits to reflect this image." No figures were released as to the total of expatriates on this team. 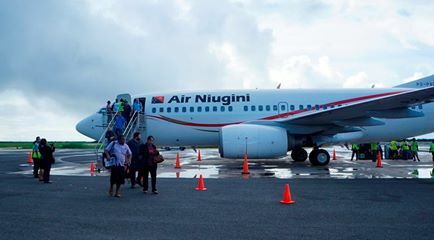 In Asia Air Niugini has services to the Philippines, Japan, Hong , Indonesia and Singapore while to Australia it flies to – Cairns, Brisbane and Sydney and further to the South Pacific including Solomon Islands, Fiji and Vanuatu. It will at the end of this year add to its international routes, the Federated States of Micronesia and next year charters to China. "On the Asian flights particularly we do have passengers who do not speak English and this is where the Filipino cabin crew become useful. Some of them can already speak Japanese, Chinese (Mandarin) and their mother tongue-Tagalo,” Air Niugini’s management said. "The Filipino cabin crew are based in the Philippines and provide their own accommodation. The Solomon Islands and Fijian cabin crew are provided accommodation in Port Moresby together with the nationals as they are based in PNG." The airlines management said.